The Korg MonoPoly is a great synthesizer for those who love to experiment with sound. It's capable of some unique tricks and is quite unlike any other monophonic synth of the era. One of the best things about the MonoPoly is it's arpeggiator - and the ability to cycle through each of it's 4 VCOs - some excellent weaving and evolving rhythms can be worked out of it. BUT... the one thing that has always bugged me about the arpeggiator is it's sloppy timing, or should I say REALLY sloppy timing. When fed with an external trigger signal - S-Trig - there is a small but very noticeable delay. You may not notice it when you're simply playing the arp from the internal clock but when triggered, for example from a drum machine, the delay is apparent. Now, when I first noticed it many years ago, I initially thought that I had a slightly dodgy MonoPoly but no - every other one I've worked with over the years has the same annoying delay. It can also be noted that the Korg Polysix shows the exact same behaviour with it's own arpeggiator - they both share a similar design. Obviously there is a lot of talk on the www about what type of trigger you need to use to clock the arpeggiator on both the MonoPoly and Polysix... some using a spikey audio signal like a rimshot, some using a dedicated clock output from a Kenton etc, a lot puzzling over V-Trig or S-Trig conversion... but no-one really talking about this small but annoying delay. To really dig into this I decided to do some tests with a Korg KR-55 - it has a dedicated trigger output which can be set to various divisions and it's an S-Trig signal... Korg's very own stock standard trigger system so should work perfectly. 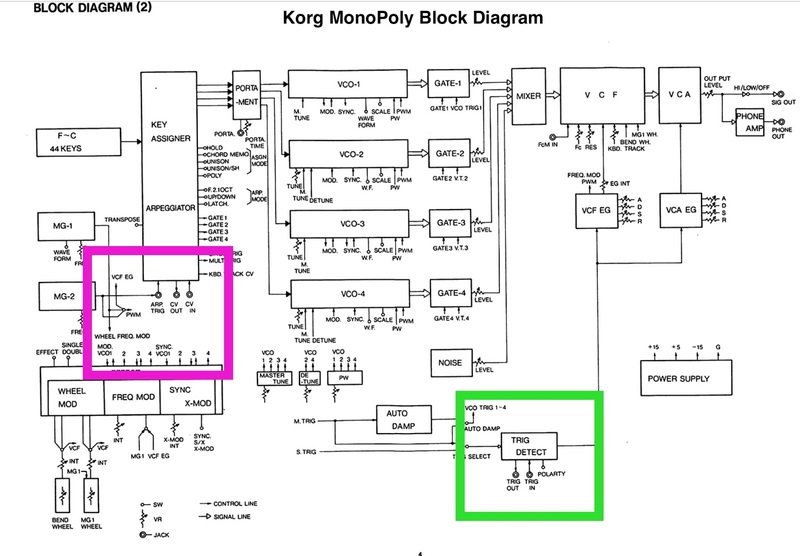 The MonoPoly manual tells us that the arpeggiator expects a +V to GND trigger signal - which we all know as S-Trig... so, put the trigger out from the Korg KR-55 into the arp trig in and all should be OK, yes? No. Well, yes and no... yes it triggers the arp fine, but not quite in time - nearly in time, maybe near enough for some, but not near enough for many others - including me. What's really interesting is if you put your S-Trig triggers into the Gate "trig in" on the MonoPoly - polarity switch set to S-Trig of course - and trigger the envelopes, it's perfectly in time, absolutely bang in time! Some detective work is going to be needed to find out where the delay is introduced - by the key assigner CPU or the following circuitry? I don't know yet... I do know that there are some very clever guys out there who have a far better understanding of how the key assigner CPU and associated circuitry works and they have done some extensive diagnosis of the timings and voice assignment process - certainly for the Polysix, maybe also for the Monopoly? A test file was recorded in Logic - left channel (upper) is the MonoPoly arpeggiator set on a short, percussive sound triggered by the KR-55 trigger out set to 1/4 notes. The right channel (lower) is the KR-55 playing a bass drum on 1/4 notes and a hi-hat offbeat for reference. Note the MonoPoly delay... around 11ms. Next, a file was recorded with the same KR-55 beat triggering the MonoPoly via the normal gate 'trig in'. Again, the upper left channel is the MonoPoly and the lower right channel is the KR-55. Here the MonoPoly is in near-perfect time.